•All 316 stainless steel plates and fittings. 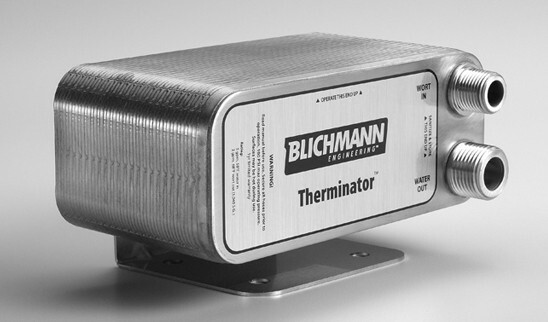 •Chill like the pros, as the Therminator™ is identical to commercial brewery chillers. •Brazed together with pure copper in an oxygen-free furnace, with no potential leaks like a gasketed unit! •Chill 10 gallons in 5 minutes to 68°F using 58°F cooling water at 5 gallons per minute (gpm). •Super-low restriction is ideal for gravity feed. •Garden-hose thread connections on the water side means no extra adapters to buy! •1/2" male NPT fittings on wort side mates up with virtually all common hose-connector types, and they're easier to sanitize than female fittings! •With the lowest water consumption on the market, it saves you money! •Comes with heavy-gauge stainless mounting bracket. Blichmann Engineering is committed to continuous product improvement, so design details may change from the photos shown.